CHICAGO -- Barack Obama's journey from community organizer to lawmaker to president was also a journey through several different Chicagos, from the city's isolated and neglected Far South Side to its elite centers of political and social power. So it's perhaps no surprise that the contest to host his presidential library has set off some classic Chicago infighting between activists in depressed neighborhoods and wealthy universities. The library is "such a prize that nobody is going to yield power to anybody else," veteran Chicago political analyst Don Rose said. The squabble also puts Mayor Rahm Emanuel, Obama's former chief of staff, in the difficult position of trying to present a single, unified bid, lest the feuding weaken the city's odds against rival campaigns to put the library in New York or Hawaii. No fewer than six potential Chicago bids have emerged, each backed by different interests. The main point of tension is between the University of Chicago, where Obama spent 12 years as a constitutional law professor until his 2004 election to the U.S. Senate, and a group advocating for Bronzeville, the city's historic center of black culture, business and politics. "They think that they can get whatever they want," Bronzeville organizer Harold Lucas (right) said of the university. "If you compare the cranes in the sky and that opulent growth of this university to the surrounding, predominantly African-American community, it's a travesty. It's a clear tale of two cities." Lucas and other critics of the university's bid say the school has been secretly working its White House connections at the expense of a plan that would benefit more of the city and honor the black community's role in electing the nation's first black president. For its part, the university says it wants to work with neighbors on a plan to build the library off-campus in a part of the South Side where it can spur development. A university spokesman declined to comment beyond the school's previous statements. 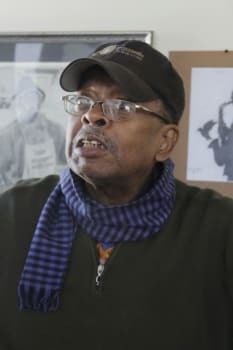 Lucas argues that the library would have more economic punch in Bronzeville, where it would be closer to downtown and where the city has repeatedly sought to launch large-scale redevelopment, most recently by buying up land as part of an Olympics bid that ultimately failed. 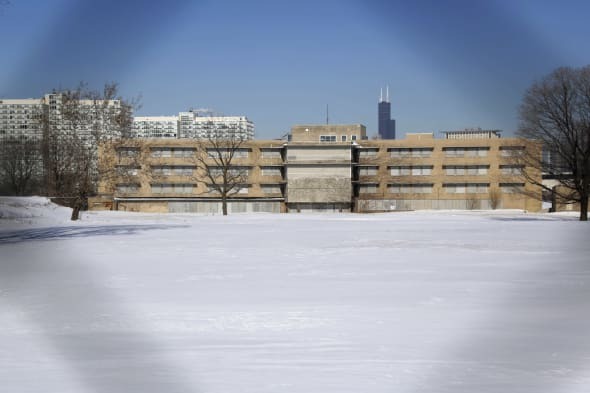 One of those plots, a lakefront site once home to the Michael Reese Hospital (pictured above), remains undeveloped and would be perfect, Lucas said. It would also boost efforts to preserve historical landmarks and develop tourism, he said. Bronzeville resident Christina English (right) was showing two friends from Cleveland around the neighborhood Friday, admiring the immaculate brownstones lining Martin Luther King Drive and stopping at a popular lunch spot. "It'd be great for the area," English said. "It's not just the history. There's so much here." Emanuel, who is leaving nothing to chance despite his own Obama connection, announced in a newspaper interview last month that he wanted a single bid for Chicago. Lucas said Bronzeville will go around the mayor and take its appeal directly to the president. There are also two potential bids on the Far South Side, one led by Chicago State University and the other by a group promoting the historic Pullman neighborhood. It was in those areas that Obama established his earliest roots in the city as a community organizer in the mid-1980s, setting up job training programs and defending the rights of public housing tenants. The University of Illinois at Chicago, on the Near West Side, is also taking a shot, as is a real-estate developer pushing the former U.S. Steel Corp. site on the southeast lakefront. The Far South Side is a longshot given its distance from downtown, lack of transportation options and the gang violence that persists there. And presidential libraries aren't guaranteed to lift the local economy. "Just sticking it out in a field somewhere and thinking that it will be an economic-development engine, it does not work," said Skip Rutherford, who oversaw planning for the Clinton Presidential Center and Park, which helped transform a high-crime area of Little Rock, Ark. The Clinton library achieved that in part by choosing a site next to the most heavily traveled interstate in Arkansas and one that was within walking distance of the state's largest convention center as well as hotels and restaurants. The $160 million project has resulted in more than $2 billion in additional development around an old warehouse district, Rutherford said. Presidents sometimes let emotion overrule reason and select library locations that are sentimental to them -- like a remote birthplace, for example -- over sites that would sustain larger numbers of visitors and have a bigger impact, Rutherford said. Besides being the official repository for presidential records and artifacts, the libraries often have presidential centers that serve as vehicles for ex-presidents to promote new policies and projects on the national and international stage. Because Obama is leaving office at age 55, he will have potentially decades to pursue such initiatives, and he may choose a location that best suits that mission. About a week ago, Obama supporters officially launched a foundation to develop the library. The foundation leader, Marty Nesbitt, is a close Obama friend from Chicago. According to Nesbitt, Obama wants a library that reflects his values and priorities, including expanding economic opportunity, promoting peace and dignity abroad and inspiring the ethic of American citizenship. "No specific site, institution, city or state is advantaged over another at this point," Nesbitt told The Associated Press in an interview when the foundation was launched. Specific groups will be invited to submit proposals in May. Those advocating for the Far South Side say that location would make a powerful statement from a president who speaks about extending "ladders of opportunity" to the middle class. 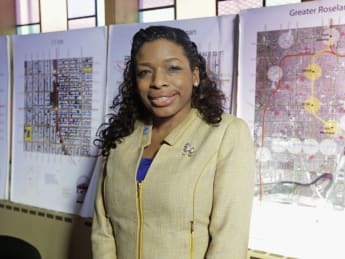 Tiffany Hightower (pictured above) grew up in the area and is executive director of the not-for-profit Developing Communities Project Inc., a job Obama held in the mid-1980s. 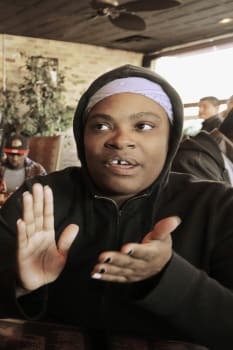 She's part of a group trying to bring the library to Chicago State University. Hightower believes the library would give young people a link to the world beyond their violence-plagued streets. "If they just had the resources," she said, "there's no telling what they could be." Location: Hilton Head Island, S.C.
Back when Bill Clinton was a little-known governor from Arkansas, this island gem of the south was a local favorite of his, says listing agent Phil Schembra. Renaissance Weekend, an invitation-only retreat for the world's brightest innovators, was held multiple times on the quiet beachfront of Hilton Head, and this five-bedroom home was just a stone's throw from the reception. But it wouldn't be the last time Clinton would visit the sleepy Southern quarters. He returned to Hilton Head as president-elect, where Shembra says he could be heard practicing his inauguration speech. "I thought it would happen once," Shembra recalls of the Clintons' first visit. "But they kept coming." The five bedroom, five bath property features contemporary decor throughout, and panoramic views of the beachfront from the pool area. Designed with poured concrete and granite, the home is likely to weather whatever the coastal climate can muster. Who would have pegged five-star general and noted sourpuss, Dwight D. Eisenhower, to be such a softy for pastoral living? This sprawling Mexican ranch, which has been in the same noted Mexican family for a century, served as a frequent stopover for Eisenhower during diplomatic trips to Mexico City, says listing agent Jack Carter. But you won't believe who else spent the night at this picturesque manor. Known as San Geronimo, this massive Mexican compound features brick and adobe flooring, high beamed ceilings, and nods to its gaucho-chic aesthetic throughout the home. The stately home and its rambling acreage lies between two mountain ranges, and offers its guests the utmost privacy. Did we mention the home includes a private airplane hangar? It makes perfect sense when considering that the ranch's other famous guest was Charles Lindbergh, the renowned aviator. A view of the dining room, where Eisenhower and a number of other high-powered guests (whose names now fill a very valuable guestbook) no doubt enjoyed full-throated discussions at dinner. In case you're the rancher type, listing agent Jack Carter says the next homeowner has the option to purchase separately up to 1,000 head of Hereford cattle, which he estimates to be worth around $1 million. Three -- count 'em -- three presidents have fished trout out of the stream of this huge, wooded estate. Originally built in the 1920s, President Hoover was known to frequent the secluded grounds of Trout Run -- the original home, Hoover Cabin, is named in his honor. Nearby Camp David, the official retreat for every American presidents since FDR, was named in honor of President Eisenhower's grandson David. The reason? Eisenhower was also known to frequent Trout Run, which is just about four miles away from Camp David, says listing agent David Desantis. With the exception of some new additions to the estate, many of the personal effects and furnishings of presidents past are displayed, just as they were decades earlier. "It's like walking back in time," says listing agent DeSantis. The third president to fish the streams of Trout Run was also one of the most reclusive. Franklin Roosevelt (who went to great lengths to hide his wheelchair-dependence from the public) used to fish from a bridge on the campgrounds. The estate wasn't the most wheelchair-accessible at the time, DeSantis says, but that wouldn't deter FDR from his love of trout fishing. Judging by those famous jowls, you probably wouldn't have guessed that Nixon had a thing for sunny, Spanish-style Mediterraneans. The 2,600 square foot home is only one of 10 official city landmark residences in the city. The property boasts two fireplaces, two balconies, an oversize library, a wet bar, and French doors leading to the side patio. While the disgraced world leader would eventually find solace in his "Casa Pacifica" ("The House of Peace"), also located in San Clemente, this Mediterranean stunner is where he vacationed before disappearing from public view. You get two guesses. This presidential pad happens to have housed the first in line, George Bush Sr., and First Lady Barbara Bush. And where else, but in the state that raised the Bush family to prominence? Nestled in the Olmos Basin with patios and terraces on four levels, this architectural home is as striking inside as outside. Light pours into the home through massive windows and the view from practically every room in the home is singularly Texas. The master bedroom opens up to its own private patio and includes an adjacent study with a fireplace. Another look at the breathtaking views from of the home's many patios. You've seen where the commander-in-chief vacations, now find out where he calls home. Can you guess who lived in this musty mancave? Click our presidential homes gallery to find out.